WIndows 10 1803 and above allows you to control which apps have permissions to certain files on your system. With each new Windows 10 feature update, Microsoft improves privacy settings. Starting with Windows 10 1803 April Update there are more ways to control file access. You can restrict or deny UWP app (not win32) access to the files stored in your Documents and Pictures libraries. You can even lock down apps and deny permissions to the full file system. To set permissions, you can do it on an app-by-app basis or multiple apps at once. To get started, head to Settings > Apps > Apps & Features to see the list of apps installed on your system. Click or tap on an app from the list and then the Advanced Options link. On the next screen, under the App Permissions section, toggle the switches on or off for which files you want the app to have access. Each app varies but you can choose to allow or deny access to libraries like Pictures, Videos, or Contacts, or Documents. Note: You can only manage permissions for Windows Store or UWP apps. 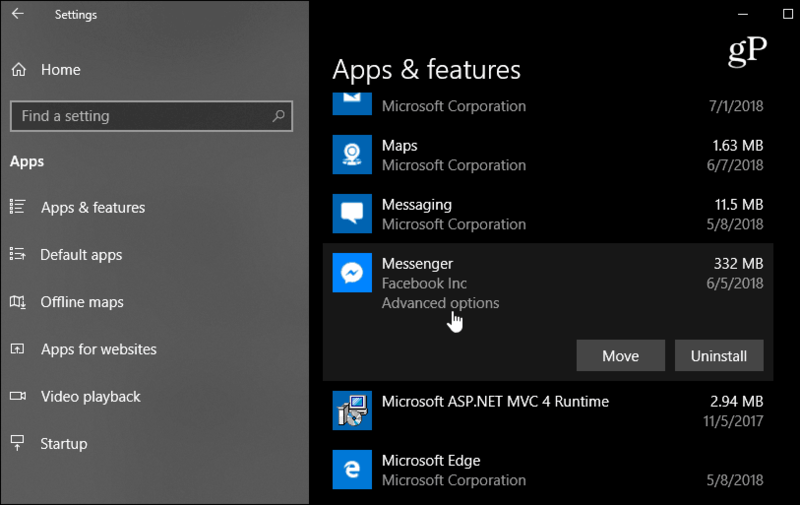 Even though traditional desktop applications are listed in the Settings section, they don’t have an “Advanced Options” link. 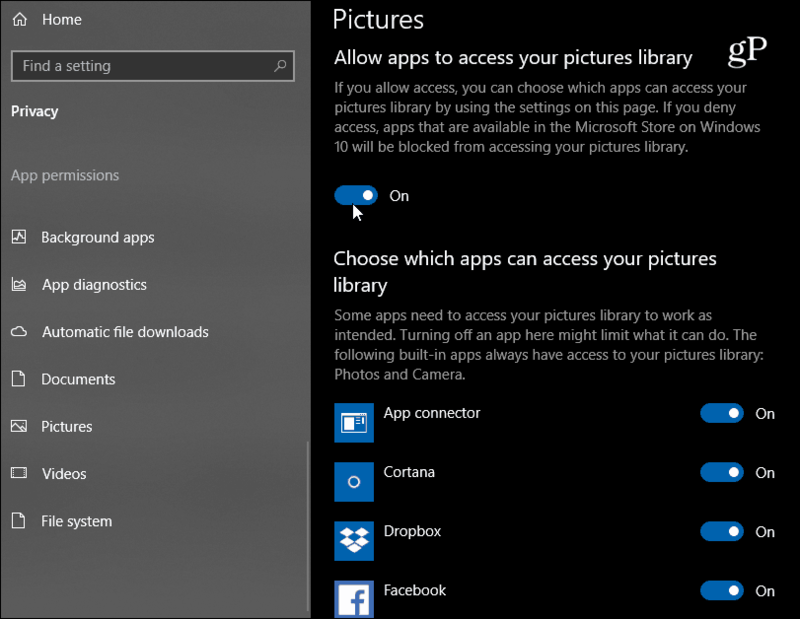 In this section, you can also choose which apps have hardware permissions, too. For example, maybe you don’t want Facebook to have access to your camera. If you want to restrict permissions to files from multiple apps, head to Settings > Privacy. Then scroll down in the left pane and choose a library you want to restrict – Documents, Videos, or Pictures. 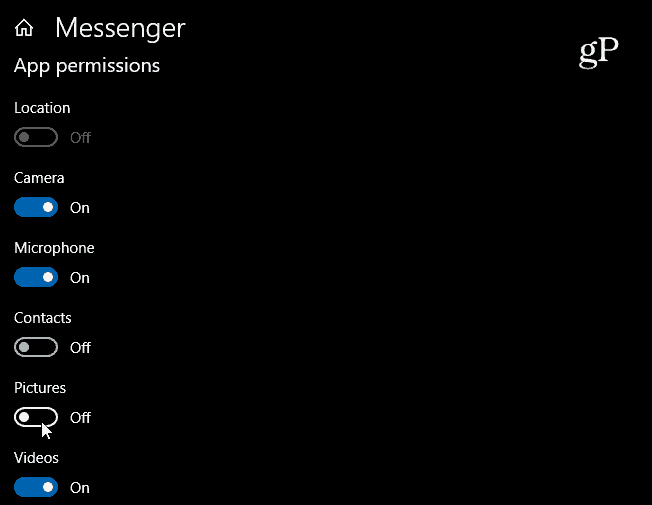 Then in the right-pane, you have the option to turn off access to all apps in one fell swoop. Or, scroll through the list of apps and turn off the ones you don’t want to have access to that library. It’s also worth noting that you can restrict apps access to the entire File System. This is a “nuclear” option and includes Documents, Videos, Pictures as well as synced files in the local OneDrive folder. This new feature is meant to provide you with more control over which apps can access your files. And while it isn’t perfect, (Some native apps such as Photos can’t be restricted) it’s safe to assume Microsoft will continue to improve on its Privacy settings as Windows 10 continues to mature.